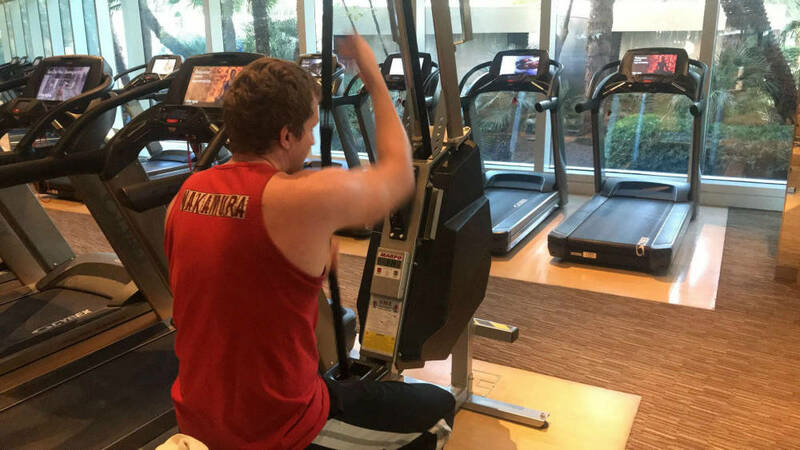 In my Vegas post I forgot to show you what the awesome gym at our resort looked like! There were so many treadmills. My heart hurt that I couldn’t use any of them, but Adam and I did get in a great lifting workout. They had this interesting rope machine that simulated what rope climbing is like (sort of). You could adjust the settings to make it harder or easier. I also did three minutes but only on the 4 setting. You are probably thinking three minutes doesn’t sound like very long, but by 2 minutes 45 seconds my arms felt like jelly. I honestly thought if I was climbing this rope to save my life I would probably let go well before 5 minutes was up! I made it all three minutes but it was so hard!!!! Speaking of working out, I said a few days ago that I want to record more workout vlogs this year. Not where I share tips because lord knows I don’t have any tips to give, but just to show what workouts I do because I like watching those kind of vlogs. 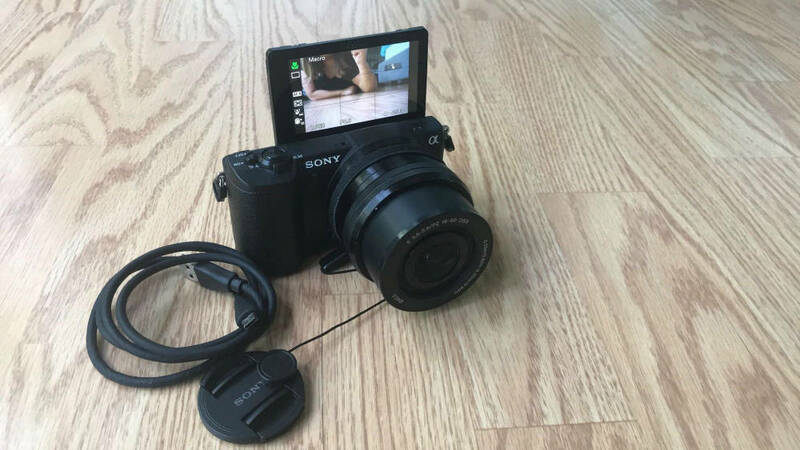 When I was watching my Vegas vlog back I realized how shaky it was because my Sony A5100 camera doesn’t have built-in stabilization to I sold it on eBay! I priced it well and it actually sold within two hours which was awesome. I purchased it used on eBay a couple years ago and now it’s on to its third home. I like that :). To replace the Sony I bought a Canon G7 X Mark II. That’s what all the popular vloggers use lol. I was hoping to film a workout video this weekend with Adam but I don’t know if the camera will be here in time. I’m so used to Amazon Prime shipping that when I saw 5-7 day delivery I almost cried! Speaking of things that make you cry, Cecil started taking his pills for hyperthyroidism yesterday. He’s so crafty eating around the pill that I eventually just had to put it in his mouth and hold his mouth closed until he swallowed it. I hate having to do that. In reality I think it’s just his urine that will be radioactive but I guess they don’t think it’s good for humans to have that in the house. That being said cats who get this radioactive treatment can live 2X longer than those just on the pills so it’s not even a question as to whether I should get him the treatment or not. I would literally get a part time job to pay for the treatment if I had to. The estimate for the treatment is $1,400 but I think Cecil’s pet health insurance will pay for it. I spoke to them yesterday and they said as long as his medical records don’t show it as a pre-existing condition we’ll get reimbursed so that’s nice. Is it crazy to have health insurance for your pet? Some people have told me yes, but I’ll be glad we have it when his treatment bill comes due :). Have you ever used that rope pulling machine? How was your first workout(s) of the year? Next Post OMG What Did I Do?!! I’m enjoying these Vegas recaps because I’m actually headed there for a work trip in 2 weeks and will be staying at Aria! Looking forward to those high-tech room controls, and also the rope machine in their gym. Oh that’s so exciting, the Aria is such a nice resort! What other tips can I tell you … There is a cozy, quiet fireplace area near the gym perfect for getting some reading or work done. There is also a Starbucks on the same level as the gym. The in-room mini bar snacks and drinks are expensive, but there is a CSV right next to the resort where you can stock up with your faves. We did that right after we checked-in. Oh, the room check-in line is almost always super long, so definitely do mobile check-in the day before. You’ll get to go into a special line that usually has no-one in it so you won’t have to wait! Thanks for the tips, especially the early check-in. Nice to know what to expect especially since I’ve never been to Vegas before! I have never heard of a rope climbing machine! I would like to try it after a lifting session to really feel like I went to burn out! I am so glad you can afford to get Cecil the radioactive treatment. I know your insurance will cover it but you put money into that so now it is paying off. I don’t have insurance so I would just drop the $1400! If Paul and I ever go to Vegas again, we will def stay at the Aria! Exactly, to spend the money or not isn’t even a question, Cecil’s health is the most important thing to me! (…well Cecil *and* Adam’s health). You’ll have to let me know how you like the camera. I’m doing more recordings right now and looking at all of the cameras options. I think I’ve watched like 50 youtube videos. Wondering if I should just get a new DSLR since my videos will all be sitting down? So many options! Hope you had a happy new year! 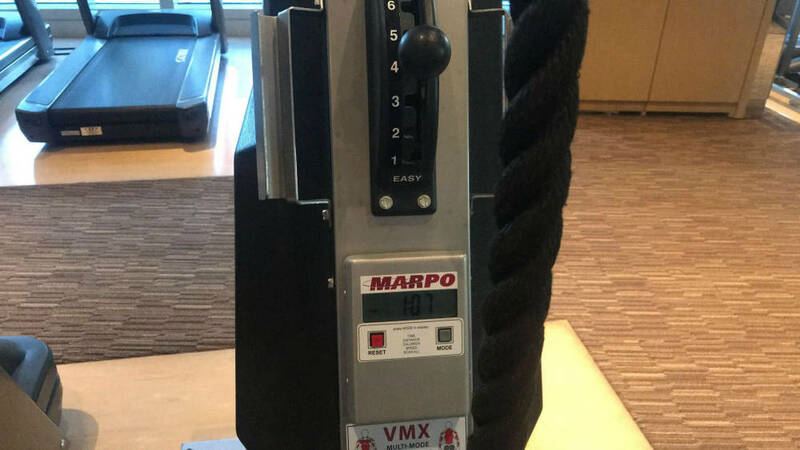 I have never heard of those rope machines before. I’m with ya, that would be a challenge to go very long on it! 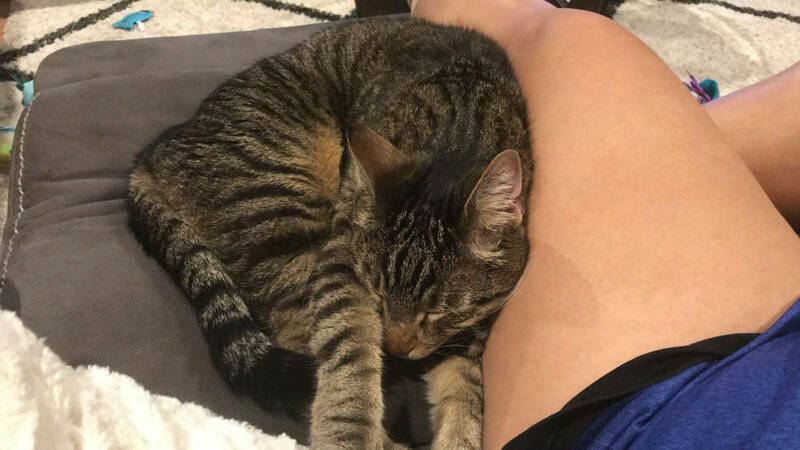 We give one of my cats a pill every day and luckily we have found a soft treat that she likes. She has done a great job eating the pill. We did go through a period where she was eating around, or just ignoring the treats, so I’m glad we found one she likes. She takes Prozac 🙂 It has been a miracle worker, stopping her from going to the bathroom on our floors! (pooping on the carpet every day!!) No joke, that behavior has completely stopped. I didn’t like the idea of her taking it initially, but eliminating all of the carpet messes has been a miracle. Poor Cecil, but I am glad he is getting treated. Tweek needs to go back but at his age I am not sure how beneficial it would be.